This is a rare picture of several sea planes both in the water and on the Links. 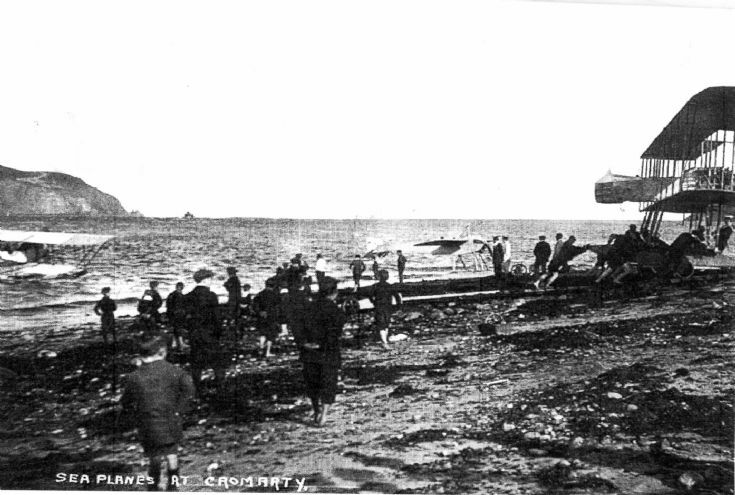 The Caudron, in the firth, was a two seater(tandem)bi-plane with floats.The Borel on the beach, was also a tandem seater, high wing monoplane, with floats. The Farman, once again a bi-plane, on floats, larger than the other two. The aircraft were powered by Renault engines, attended to by French mechanics, and were also all of French construction. I sent a copy of this PC to the Musee D'Aviation at Le Bourget in Paris, and in return they sent excellent photos of all types to me. No plans were available, but so far with the help of the photos, I've prepared 3-view profile drawings of the Borel. Anyone interested e-mail for a copy gratis. My grandfather was injured in a crash in a caudron near the isle of grain in 1913 and I have been trying to find a photo of a caudron seaplane to know what one looks like. Attn. Bob REES, I haven't been scanning the Cromarty web site for some time, due to other commitments, but there is an excellent book published, in French, about 'Les Avions Caudron' by Andre Hauet ISBN No.9782914 017138. Collection Histoire de l'Aviation No.11. Tome 1. (Allez chercher!) Another item held in my personal Aircraft research is, that Caudron aircraft were built under Licence in Alloa, here in Scotland, as land planes, period 1914/15. This is an update on my Nov. 2003 information above. Myself and some friends are researching the Alloa Caudron factory & have quite a bit if info. We suspect that they may have manufactured floatplanes but only have hints &no firm evidence. Would love a copy of the 3 view. Tried emailing but email was returned. Happy to send any info I have on factory.